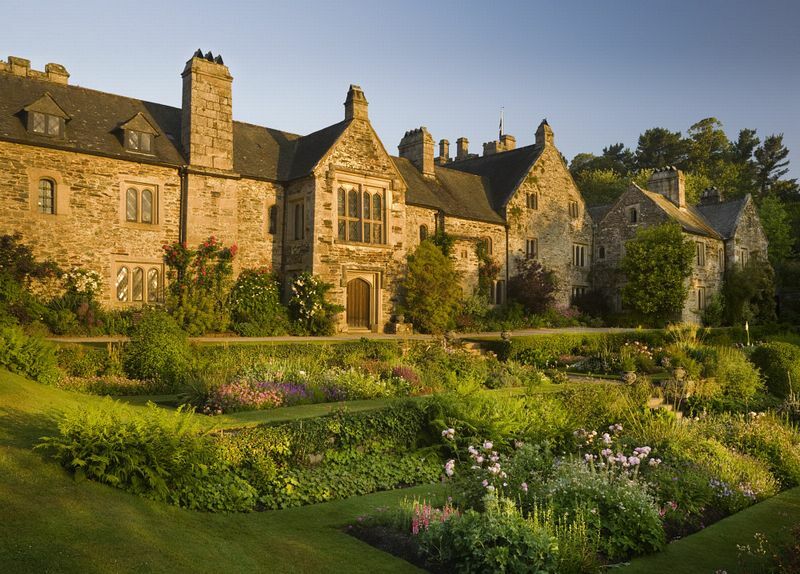 Cotehele House has been owned by the Edgcumbe family for over 600 years and is a well-preserved Tudor Manor House which even today does not have electric lighting. The Edgcumbe family acquired Cotehele when William Edgcumbe married Hilaria de Cotehele in 1353. Even then the estate was well established, on the west bank of the River Tamar. 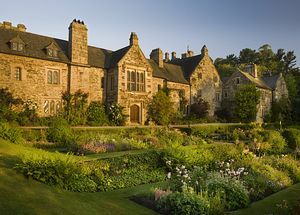 Sir Richard Edgcumbe and his son Piers rebuilt the medieval manor house between 1490 and 1520. However just 33 years later the family moved to a new and grander pile at Mount Edgcumbe in 1553, leaving Cotehele as a weekend retreat in its own medieval timewarp. the granite arched doorway into the house and let your eyes adjust to the interior gloom. Sir Richard's medieval Great Hall has a raised dais lit by three narrow windows with beautiful 15th century stained glass. There is a long oak refectory table with Adam and Eve carved on the original 17th century chairs. The walls are hung with swords, arms and suits of armour. Civil War breastplates and lobster-tail helmets are the main décor. The family chambers are small with uneven floors and have huge Tudor fireplaces. The walls are hung with richly coloured tapestries, as much for warmth as for decoration. The old drawing room is filled with black ebony furniture and the Punch Room is decorated with naked figures treading the grapes; the arched niches stand ready for storing the wine. 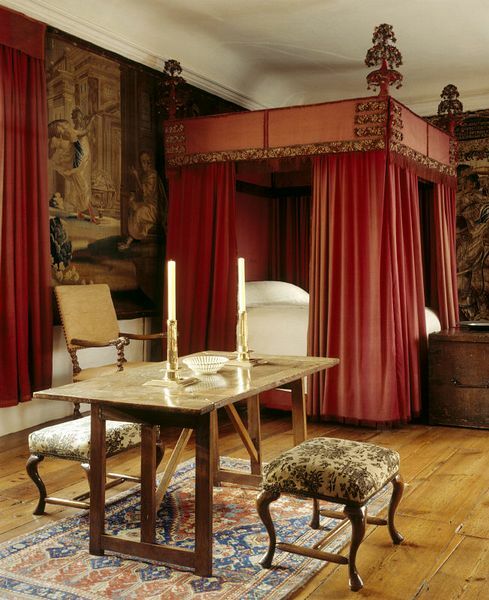 Upstairs the heavy Medieval theme continues with crimson-draped curtains on the four poster bed. The carved scene of the death of Remus is more likely to induce nightmares than sweet slumbers! Tours include the three story tower which was added to the house in 1627 and is reached by a steep winding staircase. Charles I slept here on his march from Liskeard to Exeter in 1644. Other royal visitors to Cotehele included George III and Queen Charlotte in 1789.
in Sir Richard Edgcumbe's Chapel. It is powered by two 90-pound weights, a forerunner to the pendulum. It has no face; the time was told by the striking of bells in the adjoining bellcote. 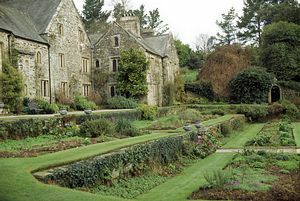 Cotehele's extensive estate includes both formal and informal gardens. Visitors can walk in the deer park, enjoy the extensive woodland or wander among the formal flowerbeds, laid out in the 19th century. The old manor house is draped in wisteria and climbing roses. Walled gardens, orchards, herbaceous borders, ponds, valley gardens terraces and courtyards take an immense amount of manpower to keep them in good order. 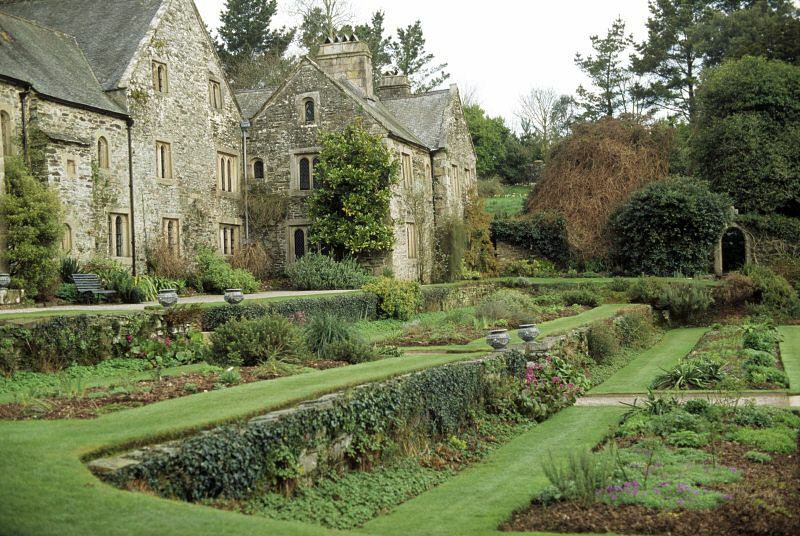 In the Upper Garden there is a tranquil lily pond and a bowling green. The Cotehele woodland has camellias, rhododendrons and ancient yews. A domed 15th century Dovecote, potting sheds, workshops and a thatched summer house are just some of the many outdoor buildings on the estate. The footpaths lead visitors down to Cotehele Quay, once busy with barges dispatching local fruit and produce. The Shamrock is a restored 1899 Tamar sailing barge moored alongside the Quay Museum. The buildings also house tea rooms, a Discovery Centre and an art gallery. The Cotehele watermill is another restored project and demonstrates flour milling. In 1947 Cotehele made history by becoming the first property in Britain to be acquired by The National Trust in lieu of death duties. First 190 Plymouth-Gunnislake-Cotehele-Gunnislake (Sundays, June to September only); DAC 79 Tavistock-Callington (passes Gunnislake ) to Calstock within 1Â½ miles. NCN27, 8 miles. Hilly route from Tavistock to Cotehele View local cycle routes on the National Cycle Network website. On west bank of the Tamar, 1 mile west of Calstock by steep footpath (6 mile by road), 8 mile south west of Tavistock, 14 miles from Plymouth via Saltash Bridge; 2 miles east of St Dominick, 4 miles from Gunnislake (turn at St Ann's Chapel). Coaches only by prior arrangement.